Google and the Chromium Project have released the Chrome Remote Desktop BETA extension for Chrome. This initial test release is to show that the secure Chrome Remoting (Chromoting) technology that has been in development for over a year works, as well as to collect valuable feedback and information. You can currently use this extension to access another computer running Windows, Linux, Mac or Chrome OS through the Chrome browser over the public internet. As stated in the description and in the FAQ, the functionality to access your computer remotely will be coming soon. The implications of this go far and wide. 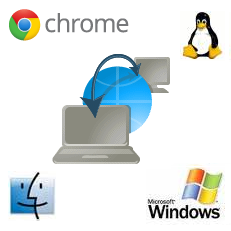 Having the ability to remotely access another person's computer is key to many tech support solutions such as Bomgar, Techinline, and TeamViewer. Bringing the access and software to the browser vastly simplifies things and lowers the cost. This also makes remotely helping a friend or family member a viable option. When the feature to access your own computer from outside the home goes live it will directly compete with GoToMyPC and LogMeIn. With the new Chrome Remoting extension and advances in Hangouts the online meeting services like WebEx and GoToMeeting could be challenged as well. What future could all of these technologies lead to? The more we move to the cloud the less local processing power and storage is needed for the individual user. Of course "the cloud" just means that the data is on a physical server someplace else, but that server can be backed up and perform better than anything an individual user could provide. Imagine if our computer was hosted remotely and all we needed was a simple device to access it. The virtualization already used at the corporate level could be implemented for consumers. These systems are reminiscent of the old IBM mainframe and terminals, but we have come a long way since then. The screen you are looking at right now to read this could reside on a server and it would make no difference to you. For the majority of everyday users a virtual computer with inexpensive access point devices would mean greater flexibly and availability. What do you think the future of computing looks like?